I remember visiting my next door neighbor's house as a nine-year-old child and receiving a glass of orangeade. I'd never had orangeade before, and when I got home I told my mother of this wonderful discovery, and asked if she could please, please, please buy some. "Orangeade is nothing but a little orange juice diluted with water and sweetened with sugar. They add cheap ingredients, make an unhealthy drink and charge a lot of money for it. Why should I pay for something like that?" she said. She then suggested that if I really wanted orangeade I should make my own, using the real oj in the fridge. This was not what I wanted to hear. I was sure that if I did, it wouldn't taste as refreshing as the kind you could buy in a store. Growing up, I never thought of my mother as a health food promoter. We ate a pretty standard meat-based diet. Except for fresh salad, which we had every night, our vegetables consisted mainly of canned peas and frozen green beans. But thinking back, when I was very young, we had very little junk food around the house. We didn't have candy, chips or soda on a regular basis. Those things might make an appearance as a special treat (TastyKake, anyone? ), but I never developed much of a snacking habit or a sweet tooth. My mother had a strict and limited food budget and she spent her dollars on what she considered "real" food, so maybe that has something to do with why my sweet tooth is underdeveloped. Nevertheless, every so often I can appreciate a really good dessert! Recently I posted about the wonderful catered dinner we enjoyed with our veg meet-up group. It was a four course meal catered by Jen Gaber of Nutshell Catering, and we loved it. My recipe for edamame hummus was inspired by one of the appetizers, and now I have Jen's recipe for one of the desserts. These were very fudgy brownies and maybe the best brownies I've ever had. I altered the recipe slightly when I made these and needed more baking pan space than the original recipe called for. Don't be too alarmed by the ingredient quantities, this recipe makes brownies for a crowd. (Or maybe you REALLY like brownies and it's only enough for you! Could be.) I think I made about 40, using a 12" x 18" and about 3/4 of an 8" x 8" pan. They were cut more or less 2-1/2" square. I'm going to give you (with permission) the original recipe for very dense and fudgy brownies, and then my slightly altered one. I made changes to accommodate cost, texture, and ingredients on hand. Mix the flaxseed, sugar, maple syrup, oil, milk, vanilla and espresso powder together in a large bowl. Let sit for 10 minutes. After the wet ingredients have had their 10 minute sit, sift the flour, cocoa powder and sea salt into the wet ingredients and mix. Spread into a lightly oiled 12" x 18" sheet pan. Sprinkle with semi-sweet or bittersweet vegan chocolate chips. Bake at 325 degrees Fahrenheit for about 20 minutes. Jen says, "I pull them out before they look entirely done, since the residual heat keeps cooking them, then they won't be dry." Notes and changes: When I made the brownies, I used one cup of maple syrup and 3/4 cup of agave syrup. I didn't have enough maple syrup on hand, and it seemed too expensive to use 2 cups, anyway. (I will probably reduce the maple syrup even farther next time I make these.) I also added one level tablespoon of baking powder with the flour and cocoa because I wanted a less dense, softer brownie. Because I expected the brownies to rise a bit, the 12 x 18 pan wasn't quite large enough, so I also used about 3/4 of an 8" square pan. Without the baking powder, they would probably be fine in the one large pan. I used white whole wheat flour and it worked great. (I actually meant to use whole wheat pastry flour but someone switched my bins and I didn't notice until all the flour was in!) I didn't have espresso powder so I used freeze-dried coffee crystals. I baked my brownies for 20 minutes but I think the big pan could have used at least five minutes more. The small pan was just right. After the wet ingredients have had their 10 minute sit, sift the flour, cocoa powder, baking powder and sea salt into the wet ingredients and mix. Let them cool at least one hour before cutting. If you let them cool completely, the chocolate chips will harden and make a crunchy topping. If you cut while still warm, the chips will turn into frosting. Your choice. Wow, that recipe sounds like it makes a TON of brownies. Not that having extra brownies around is ever a bad thing! 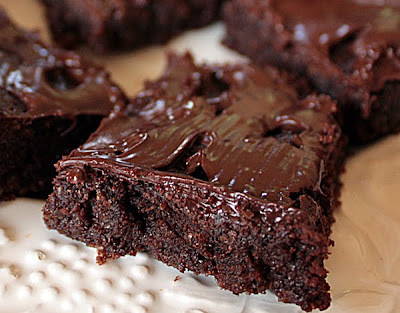 The recipe sounds great, I love adding flaxseed to my brownies. These look so, so good! Especially with the frosting on top. What a nice way to eat some flax seeds. Those brownies look absolutely amazing! PS I liked your story about living in a health food type of house and how you didn't even realize it! I wish I could say the same for my own time growing up, but my childhood was filled with KoolAid, Cheeto-s, Oreo cookies, etc. Oddly enough, however, I also have an "underdeveloped" sweet tooth! I guess our different paths led us to the same place! These comments are from Andrea, not Ken. I'm using his laptop and now it's too much trouble to go back and sign in. We're on the road from Madison to Seattle and have been driving all day, and I'm really tired! The recipe does make a ton of brownies but it seems easy to halve it, which I'll probably do if I'm not makin them for a crowd. I can't really claim to have perfected the recipe since the brownies were pretty great to start with, but thanks. Maybe we are just born with a preference for certain tastes. Haha, if I ate that many brownies I would probably eat them all! But that's not going to stop me making a smaller batch of them. YUM!! Those pictures are insane! Seriously gorgeous, I can't wait to make them. Thank you SO much for the recipe. Wow, these look completely amazing! I would definitely make a half recipe. They are way too tempting. Even though my mom used frozen and canned veggies, we didn't have too much junk either. Just the sugary breakfast cereals and poptarts! These look just unbelievably good. I'm sure I'd go for the "frosted" brownies, too. Grrr. I keep forgetting that this is Ken's computer and he's signed in. But you know it's Andrea, right? I took most of them to a potluck or I probably would have eaten them all. They are way too tempting for sure. We have only one travel day left. Thank heavens. OMG, those have to be the most amazing vegan brownies I have ever seen. Most are way too cakey or a gloppy mess, but these look perfectly fudgy! These sound really, really good - and 1 cup of flaxseeds? Holy health-food batman! I would probably add even more chocolate chips to have that lovely frosting effect! Hope you're having a great trip. When I first tasted Jen's brownies, I was frantic to get the recipe. These are GOOD! There's a lot of everything in this recipe. It makes a LOT of brownies. But, yeah, a cup of ground flaxseeds goes a long way towards easing any guilt about eating too many. That's exactly how they tasted! I think i'd go into brownie coma with that much chocolately goodness. I just found this link on the PPK. They look delicious! I can't wait to try them :) I'm definitely following your lead and letting the chocolate chips melt! I'm so sorry your brownies didn't turn out well. I made them many times to take to events and they were always wonderful and well-received. There are so many variables in ingredients and cooking styles that it's hard to say what might have gone wrong. In any case, I posted the recipe eight years ago, and although I usually retest a recipe that didn't work for someone, I am no longer able to eat gluten so I can't make this one again as written. Again, so sorry it didn't work out.